There are plenty of reasons people come to Total Chiropractic Care and Wellness to deal with back problems. You could be suffering from pain related to a car accident or a workplace accident. You may have pain as a result of a sports injury or you could have chronic pain from lifting heavy objects. Another cause of back pain can be related to the spine being misaligned and one issue we often hear about from patients is scoliosis. This is a spinal deformity that can lead to back issues. At Total Chiropractic, we treat patients with all types of back problems. Our doctor, Todd Goldman has been practicing for more than 20 years. We offer a number of services from chiropractic manipulation to spinal decompression and trigger point therapy. We’ll also tell you how to make lifestyle choices such as changing your diet or adding an exercise program that will bring you to optimum health. 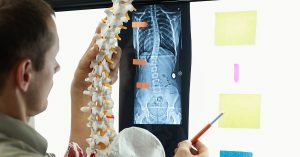 We want to make sure our patients have as much information as possible, so we want to tell you about scoliosis treatment options. Scoliosis is a sideways curvature of the spine that occurs most often in connection with the growth spurt that comes prior to puberty, according to the Mayo Clinic. In most cases the cause is unknown, but the condition can be associated with neuromuscular conditions and birth defects. Most cases are mild. Some cases do get more severe as children grow and a severely curved spine can lead to lung and heart damage. Severe scoliosis is more common among girls rather than boys. Among the symptoms related to scoliosis are uneven shoulders or an uneven waist. You may notice that one shoulder blade will appear more prominent than the other, or that one hip may appear higher than the other. If you notice these symptoms you should see a doctor. According to the Scoliosis Research Society, treatment options run on three tracks. For patients that have small curves, observation is recommended. Bracing is recommended for those with moderate curves. A brace won’t correct the curve but can correct further progression. In the most severe cases, usually, those which involve curves greater than 50 degrees in adolescents, surgery is advised. So how can chiropractic help? According to the Clear Scoliosis Institute, chiropractic care can treat scoliosis patients, but it must be understood that the condition isn’t technically curable. It requires ongoing care. Traditionally, chiropractors work on joint mobility issues, but with scoliosis, joint mobility isn’t the problem it’s the location of the joints that are off. This means that joints need to be repositioned, and in order to do this, your muscles need to be relaxed. Your brain needs to be trained to use the muscles and spinal joints differently. In order to do this, the most effective treatments are scoliosis massages, stretches, and exercises along with adjustments that are designed specifically for scoliosis patients. If you’re looking for treatment for scoliosis or dealing with other forms of back and neck pain, Total Chiropractic will help. We’ll consult with you and give you an individualized treatment plan. If you need chiropractic manipulation, we’ll tell you and we’ll also let you know what type of exercise plans may suit you. To learn more, contact Total Chiropractic today. Going to Dr. Goldman's office I feel like he has everything there.